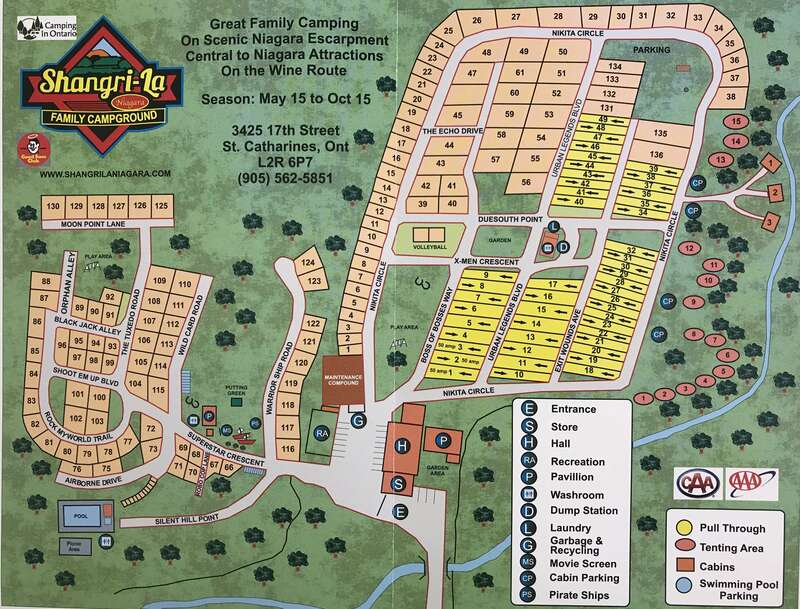 Click on thumb to the left, to view a large and detailed sitemap of Shangri-La Niagara Campground. Shangri-La Niagara has 185 RV sites available (each with water and electrical services) and 15 non-service tent sites, on 48 acres of scenic land. Sites can be rented by the day, week, month or season and are available to R.V’s, truck campers, trailers and tents. Pull through 50 amp sites are also available. Groups and pets are welcome. Shangri-La Niagara offers a large recreational hall for clubs, groups and special occasions. Also, enjoy a game of outdoor billiards, table tennis or relax with a game of giant chess in our peaceful garden. Check with Shangri-La Niagara reps for both bookings & additional info. Cool off from the summer heat by enjoying our 42ft x 80ft outdoor pool. We also have a separate wading pool for the little tykes. Shangri-la Niagara offers the use of a large barbeque. You’ll be able to host one great outdoor celebration with family and friends on our Pavilion. Expand your camping experience by renting one of our unique pioneer-style cabins. Each cabin has its own charm, and is situated in a beautiful forest setting. There is an upper loft for children to sleep and a wall bed below for adults. Each cabin is insulated and comes with electricity and heat.